Joanna Thaler (email: joanna.thaler@gmail.com) is a graduate student in the English department at the University of Texas at Austin. A two-time winner of JASNA’s annual essay contest, she is currently working on her M.A. and Ph.D.
in the British Broadcasting Company’s 2008 version of Sense and Sensibility, Andrew Davies’s screenplay details the duel between Colonel Brandon and John Willoughby that Jane Austen so frustratingly omitted from her 1811 published text. The scene flashes between Brandon and Willoughby, battling with swords, their seconds waiting patiently by, while Marianne Dashwood feverishly composes her heartbroken last letter to Willoughby. At last, Brandon draws blood from Willoughby’s arm at the same time that Marianne drips red sealing wax on her letter, and the duel ends with Willoughby’s submission and Marianne’s tearful resignation. Marianne’s dripping red wax ties textual feminine space to off-page masculine space. Austen’s readers have been imagining this duel for two hundred years. In commentary on this DVD, Davies defends his adaptation, asserting that he wanted to explore the “dark subplots” of the novel, such as the duel, and “turn them into proper scenes” in order to make viewers look back through the book to seek out such scenes in the novel. Including invented scenes is a familiar tactic of Davies, perhaps most vividly recollected in Mr. Darcy’s dripping emergence from the lake in the BBC Pride and Prejudice (1995),1 but Davies is certainly not the first adapter to imagine the missing duel. In 1987, Mary Hardenbrook constructed a playful hypothetical gunfight between Brandon and Willoughby, the Gunfight at the Combe Magna Corral, a nominal allusion to Tombstone, Arizona’s infamous gunfight at the O.K. Corral, involving Wyatt Earp and Doc Holliday. Hardenbrook’s account ends with Brandon and Willoughby’s reconciliation as they ride together “away over the horizon” (35). Naturally, Austen and Hardenbrook draw different resolutions regarding the relationship between Brandon and Willoughby, but Hardenbrook’s account is meant to be humorous. Both Hardenbrook’s and Davies’s creations offer a certain amount of imaginative resolution to the problem of Austen’s great omission, at least for those of Marianne’s romantic turn of mind. However, what Austen leaves to our imaginations demands a more concrete study. Because of Austen’s relatively recent surge of popularity, new textual editions of Sense and Sensibility continue to surface, meeting the demand of consumers, and sporting contemporary front covers and rather kitschy summaries on their back covers. Unfortunately, most editions either fail to account for the duel at all, or do so inadequately.2 Considering Asuten’s extensive literary exposure to dueling—for example, in novels like Samuel Richardson’s Clarissa or Frances Burney’s Cecilia—the omission of the particulars of Brandon and Willoughby’s duel seems peculiar for such a careful writer. Some editions of Sense and Sensibility account for the duel by merely suggesting that it occurred, without providing any other significant historical detail or associated cultural complexity. One short note that I have found comes from the 2003 Penguin edition and explains that Brandon and Willoughby met “To fight a duel. Until 1844 the British Military Code authorized dueling between soldiers, but otherwise it was illegal, although still practiced” (Ballaster 199). This edition provides minimal historical context regarding dueling law; much is left unexplained. Davies’s adaptation of the off-page duel, then, cinematically imagines what texts omit. While new textual editions of Sense & Sensibility often avoid any mention of the duel, leaving a disappointing silence in narrative context, Davies manages to include over one minute of gripping, yet silent, dueling. Although her omission of the duel may be frustrating for some readers, Austen does not write the duel because, to put it simply, her novel’s narratives rarely, if ever, remove from the immediate perspectives and surroundings of her principal female characters. Vince Brewton argues that Austen uses the duel to illustrate power relations between idle men and their egos in eighteenth-century English society. Brewton asserts that Elinor Dashwood’s silence regarding Brandon’s duel acts as Austen’s “silent critique” of both the duel and upper middle class English society (79). While I partly agree with Brewton’s suggestion, I think that Austen was more interested in the duel’s relation to the women of eighteenth-century society than in the men and their egos. In Sense and Sensibility, readers often view the narrative through the eyes of Elinor Dashwood or other female characters, and Austen does not write scenes, such as Brandon and Willoughby’s duel, that occur only between men. However, Austen is clearly interested in the duel’s ability to both dramatize and propel her narrative, and she adapts the duel into a verbal exchange between Lucy Steele and Elinor over the issue of Edward Ferrars’s love and loyalty. Austen writes this duel into the conversational spheres within which her female characters move. Davies, by adapting the off-page duel to the screen, highlights the ability of film and other media to permeate these “off-page” worlds—the realm of men and their conversations and actions—to which both Austen and her principal characters are not privy. Films such as Davies’s Sense and Sensibility open up the possibilities for studying other “off-page” scenes in Austen’s novels, and they suggest that we consider not only the text that Austen confined on the page but what she allowed to lurk on its periphery. Some agreed with Johnson’s view, while others, including Jean Jacques Rousseau and William Hazlitt, argued against the duel as an acceptable practice (Kiernan 165-84). Jane Austen herself seems to comment on the duel as needless. When Brandon admits his “appointment” with Willoughby, Elinor, probably the most sensible of Sense and Sensibility’s characters, “sighed over the fancied necessity of this; but to a man and a soldier, she presumed not to censure it” (211). Elinor might silently censure Brandon’s actions, but her silence reflects Austen’s general silence on the duel itself, and not necessarily Austen’s personal moral perspective on the duel. It seems hasty to assert that Austen censures the duel as Elinor does. After all, Brandon turns out to be the romantic hero of the novel. As Kiernan points out, “What serious writers or artists have made of [the duel] is often more meaningful than the actual fights. . . . Their ways of looking at it offer much in the way of insight into the manners, the social or moral atmosphere, the self-picturing of the upper classes” (9). Over the centuries monarchs and the military nominally attempted to enforce legal control over the duel. The military had more success than the monarchy in England, if “success” means the deterrence of dueling. Monarch after monarch proclaimed against dueling, threatening severe punishment for the practice, but each continued to pardon duelists. From 1760 to 1820, during the reign of George III, 172 duels were reported to the monarchy, but only 18 duelists saw a trial and only 2 were executed, despite the 91 fatalities that resulted from the duels (Kiernan 102). In the military, officers often dueled one another, and their subordinates imitated them when they felt the need, but dueling was much more regulated in the armed services than in a citizen’s forum. Dueling frequently occurred overseas, particularly among British soldiers and officers serving in India (24). Austen, interestingly, tells us that Colonel Brandon also was previously in the East Indies, battling his broken heart over Eliza’s marriage to his undeserving brother, and perhaps practicing his aim as well (206). Based on histories, novels, and personal accounts of eighteenth-century duels, we know that Davies’s dueling scene, though romantically involving sweat, swords, and blood, is likely simply a wink toward our sentimentality. Because Brandon and Willoughby “‘returned unwounded’” (211), it is highly unlikely that they used swords for their duel, since a duel with swords rarely, if ever, ended before blood was drawn, and was extremely rare by the late eighteenth century (Willet 100). Cecil Willet and Phillis Cunnington note that “the sword continued from 1700 until the 1780’s when it was gradually discarded except for ceremonial occasions. As a weapon of defense its place was being taken by the pistol. As a symbol of gentility it was being rivaled by the long cane, from about 1730” (100). Around the time Austen began writing Sense and Sensibility, the sword was most likely a costume appendage only. Austen makes no mention of Brandon or Willoughby carrying swords, though she does give Willoughby a hunting gun as he hurries to help Marianne when she hurts her ankle. As Willoughby is the challenged man in the duel, he would have the privilege of choosing the weapons to be used. Not only were swords almost universally out of fashion at this time, they would be a poor choice for Willoughby in other ways. The older, military Brandon was likely professionally trained in swordplay, while Willoughby probably has little to no experience with sword fights. Also, Austen immediately casts Willoughby as a gunman, mentioning his gun twice within two sentences when we first meet him. Though this gun is almost certainly for hunting and not a pistol, it remains a safe assumption that Willoughby, young and at the height of fashion and youthful pursuits, may be more adept at handling a gun rather than a sword. Here Austen emphasizes the tension between Lucy and Elinor by having each woman pointedly identify the other as a rival (you, explicitly not me). Both Lucy and Elinor defensively emphasize one another, each engaging the other as a verbal rival. Without much more hesitation, and first offering “one side glance at her companion to observe [her words’] effect on her, and then “fixing her eyes upon Elinor” (129), Lucy reveals her engagement to Edward. Taking advantage of Elinor’s stunned silence and disbelief, Lucy begins to reveal and utilize her hidden weapons. The first weapons that Lucy employs affect Elinor’s emotions. They include Lucy’s reference to Edward’s affection for Elinor and Marianne as merely brotherly, followed by a long and emphatic pause noted by Austen (130). Lucy’s uncle, Mr. Pratt, and his school also prove useful in Lucy’s repertoire of weaponry as verbal reminders of her own closeness to Edward and Elinor’s respective distance. Before Lucy reveals her greatest weapons, Elinor attempts to fight back, asserting that they “‘cannot mean the same Mr. Ferrars,’” and she preserves an ostensible outward calm. However, Lucy insists that her Edward is the same Edward, and shows Elinor a miniature of him to “‘prevent the possibility of mistake’” (131). This miniature proves painful to Elinor’s touch (131-32). Lucy’s next weapon, her handkerchief and its accompanying tears as she relates her sadness and loneliness, does not lead Elinor to “feel very compassionate” (133). However, the weapon that “overcomes” Elinor—“her heart sunk within her, and she could hardly stand”—is Edward’s most recent letter to Lucy, which Lucy “carelessly shows” to Elinor (134). This revelation is not careless but a pointed and direct attack on Elinor’s feelings for Edward. Finally, as if the wounds created by this conversation are not deep enough, Lucy reveals that the ring of hair previously observed on Edward’s finger, which Elinor was convinced was her own, is actually Lucy’s (135). Elinor is left “mortified, shocked, confounded” (135), and retreats from this conversation to Barton Cottage. Lucy and Elinor duel with decorum and stilted conversation. Austen likely named Lucy Steele, a masterful manipulator and weapons specialist, with care. With the push toward industrialization in the eighteenth century, steel became a popular source for the mass production of weapons. The Oxford English Dictionary catalogues many different definitions of “steele,” including two that might apply to Lucy. 3. A general name for certain artificially produced varieties of iron, distinguished from those known as ‘iron’ by certain physical properties, esp. greater hardness and elasticity, which render them suitable as material for cutting instruments, and for various other industrial purposes. Throughout the novel, Lucy conducts herself with the absolute hardness of steel. From her battle with Elinor to her eventual marriage to Robert Ferrars, Lucy achieves all that she wants, and does so with unapologetic rigidity. When Lucy and Elinor’s conversation is set in the context of dueling practices in the eighteenth century, the similarities between their verbal battle and the physical duel between Brandon and Willoughby suggest a more complicated understanding of Austen’s use of the duel in the novel. Neither duel ever “‘got abroad,’” since Elinor keeps Lucy’s secret and Brandon and Willoughby return unwounded (211). Austen explores and applies duels in different forms in Sense and Sensibility, accessing the masculine sphere of eighteenth-century dueling in the only accepted way for a woman—through conversation. Elinor’s conversation with Lucy is equally private, equally harmful, and equally distressing as Brandon’s duel with Willoughby. The female dialogue of the text is given verbal authority in this scene, while Davies allows for male visual interludes with flashes to the dueling encounter. The contrasting spaces that the characters inhabit—the bedroom for Elinor and Marianne, dewy park grounds for Brandon and Willoughby—also illustrate film’s ability to distinguish the domestic female space (text) from the semi-public male space (off-page) while temporally juxtaposing each space’s events. Austen represented the duel both in her physical text through female conversation and in the text’s periphery with the off-page duel between men; film, however, allows simultaneous visual life for both of these expressions. The duels between Elinor and Lucy and Brandon and Willoughby each emphasize the performativity of eighteenth-century male and female culture. Austen contains her ferocity against oppressive eighteenth-century societal pressures on women but allows for later interpretation focusing on what is peripheral to that conversation, the darker scenes between men. Adaptations like Davies’s allow multiple aspects of Austen’s fiction to be explored, such as the off-page violence in scenes involving exclusively male characters. 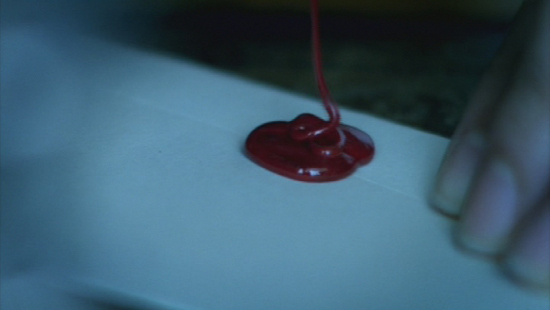 For instance, Davies’s juxtaposition of the dripping red sealing wax that closes Marianne’s letter to Willoughby with the blood Brandon draws from Willoughby’s arm illustrates the crossovers between these two differently violent and adjacent worlds. The red wax recalls the violence of the male dueling scene, letting it visually, yet silently, echo in the domestic space inhabited by women. As Andrew Davies incorporates the violence of these scenes into the more familiar domestic and female scenes, he gives viewers a taste of eighteenth-century masculine violence previously consigned to the periphery of Jane Austen’s novel. The clip used in this essay satisfies the criteria for fair use established in Section 107 of the Copyright Law of the United States of America and Related Laws Contained in Title 17 of the United States Code. 1. Perhaps also relevant to this discussion, is Davies’s invented fencing scene between Mr. Darcy and a fencing master, also in the 1995 BBC Pride and Prejudice. Darcy fights the fencing master (also, his love for Elizabeth), and concludes the scene by saying passionately to himself, “I shall conquer this. I shall.” For a more extensive discussion of fencing, see Juliet McMaster’s essay in this edition of Persuasions On-Line. 2. One 2010 edition’s editor claims that, by avoiding critical interpretations of Austen’s text, she does not “threaten [Austen] with dull, scholarly analysis” but instead provides the text as it was meant to be enjoyed—“untouched.” Interesting, then, that this editor also expresses the following sentiment in the margin near the off-page duel: “This is where Miss Austen drives us a little nuts. They dueled! Brandon and Willoughby dueled! And this is as much as Austen gives us!” (Klassen 192). 3. Here Andrew Davies again capitalizes on Jane Austen’s silence. Though Austen might be scandalized by the scene, Davies opens the 2008 Sense and Sensibility film with Willoughby’s seduction of the young Eliza, visualizing yet another of the “dark subplots” in his adaptation. 4. For an interesting discussion on the duel as a reflection of eighteenth- and nineteenth-century masculinity, see Erin Mackie. 5. Davies invents another encounter between Brandon and Willoughby, in which they attend a private party given by Sir John Middleton and remove behind a curtain to discuss Willoughby’s “intentions” toward Marianne Dashwood. Brandon initiates the conversation. 6. Suzie Park writes about the eighteenth-century sentimental novel and its characters’ attempted communication (and subsequent miscommunication). Park uses Sense and Sensibility as one example of the failure of the countenance (silent body language) of the sentimental novel’s heroines to convey comprehension of any character’s feelings: just such a situation as is illustrated in Marianne and Elinor’s failure to communicate, in their refusal to verbally communicate their feelings to one another. Austen, Jane. Sense and Sensibility. Ed. R.W. Chapman. 3rd ed. Oxford: Oxford UP, 1933. Ballaster, Ros, ed. Sense and Sensibility. London: Penguin, 1995. Boswell, James. Life of Johnson. New York: Barnes, 2006. Brewton, Vince. “‘He to defend: I to punish’: Silence and the Duel in Sense and Sensibility.” Persuasions 23 (2001): 78-89. Burney, Frances. Cecilia, or Memoirs of an Heiress. Ed. Peter Sabor and Margaret Anne Doody. Oxford: Oxford UP, 1999. Hardenbrook, Mary. “Gunfight at the Combe Magna Corral.” Persuasions 9 (1987): 34-35. Kiernan, V.G. The Duel in European History: Honour and the Reign of Aristocracy. Oxford: Oxford UP, 1988. Kirchner, Paul. Dueling with the Sword and Pistol: 400 Years of One-on-One Combat. Boulder: Paladin, 2004. Klassen, Julie, ed. Sense and Sensibility. Minneapolis: Bethany, 2010. Mackie, Erin. “Boys Will Be Boys: Masculinity, Criminality, and the Restoration Rake.” Eighteenth Century: Theory and Interpretation 46.2 (Sum. 2005): 129-49. McMaster, Juliet. “Good Punishes Bad? The Duels in Sense and Sensibility.” Persuasions On-Line 32.1 (Win. 2011). Park, Suzie. “Compulsory Narration, Sentimental Interface: Going Through the Motions of Emotion.” Theory and Interpretation 50.2-3 (Sum.-Fall 2009): 165-83. Richardson, Samuel. Clarissa, of the History of a Young Lady. Ed. Angus Ross. London: Penguin, 1985. Sense and Sensibility. Screenplay by Andrew Davies. BBC. 2008. DVD. Willet, Cecil, and Phillis Cunnington. Handbook of English Costume in the Eighteenth Century. London: Faber, 1957.